Mangaluru, Dec 05, 2017: In a move that will give Tulu activists striving for inclusion of the language in the 8th Schedule of Indian Constitution a head start, the B C Road-based National Computer Literacy Committee has come up with version 5.0 of Tulu script software Thawlava. Launched first in 2009, the software has undergone consistent changes over the years based on consistent feedback from linguists and version 5.0 has been released as a desktop variant. Pravinraj S Rao, director of National Computer Literacy Committee who has been at the task since the launch of version 1.0 for Android devises in 2009, said the team consisting of B Sathyashankar, Pradeep D’Souza and Vivek Acharya have worked towards coming up with the latest version. "We have taken inputs from eminent linguists such as Venkataraj Punichithaya in re-defining the software and kept it in tune with views of the purists as well," he said. The key in releasing version 5.0 was getting the stressed syllables right, Pravinraj said, adding there has been no change in the 50 alphabets that was present in the first version to the latest version. "Since the original Tulu script is hand written, converting it in to a standardized alphabet list with the stressed syllables to go with was a time consuming and demanding task," he said, adding the team has managed to get dimensions of alphabets and stressed syllables just right. 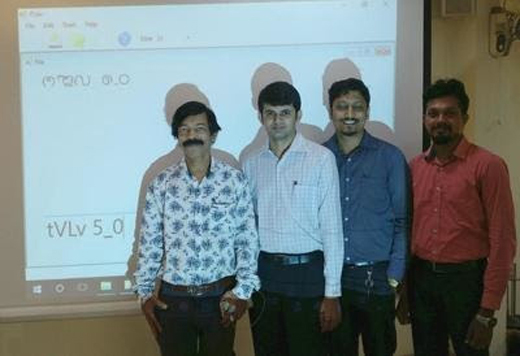 Sathyashankar said the team that has followed the Nudi layout on the keyboard to make it easier for those with knowledge of Kannada to use this software, is now working on developing version 5.0 for Android devises as well. "At present, only version 1.0 is available on Google Playstore," he said. Efforts are also on to bring Thawlava out in Unicode in the near future, Sathyashankar added.